The ACPA has recently obtained group rates for several types of insurance, potentially giving our members siginificant savings. The ACPA has formed a new partnership with TD Insurance Meloche Monnex (TDIMM) to provide our members with preferred rates on home, apartment, condo, and auto insurance. In business for 60 years, TDIMM is the largest direct response insurer as well as the second largest personal lines insurer in Canada. TDIMM can save you money on unique insurance policies for your home, its contents, your secondary and rental properties, your recreation vehicles and identity theft. For more details, visit www.melochemonnex.com/pchem or call (toll-free) 1-866-955-5558. ACPA has worked with the Alberta Retired Teachers’ Association (ARTA) to make the ARTA Retiree Benefits Plan available to eligible ACPA retirees (present and future). The ARTA Retiree Benefits Plan offers four Extended Health Care plans to choose from. Coverage highlights include: prescription drugs, paramedical coverage (chiropractor, physiotherapist massage, etc. ), coverage for wheelchairs, hearing aids and CPAP machines, and much more. There are also three Dental Care plans to choose from, which include dental exams, cleanings, fillings and minor and major restorations. Emergency Travel Insurance with 100% covereage for sudden and unforseen emergencies is also included. For more information see the introductory cover letter for ACPA members or visit the Member Only Benefits page by signing into your online ACPA membership account at the top of this web page. 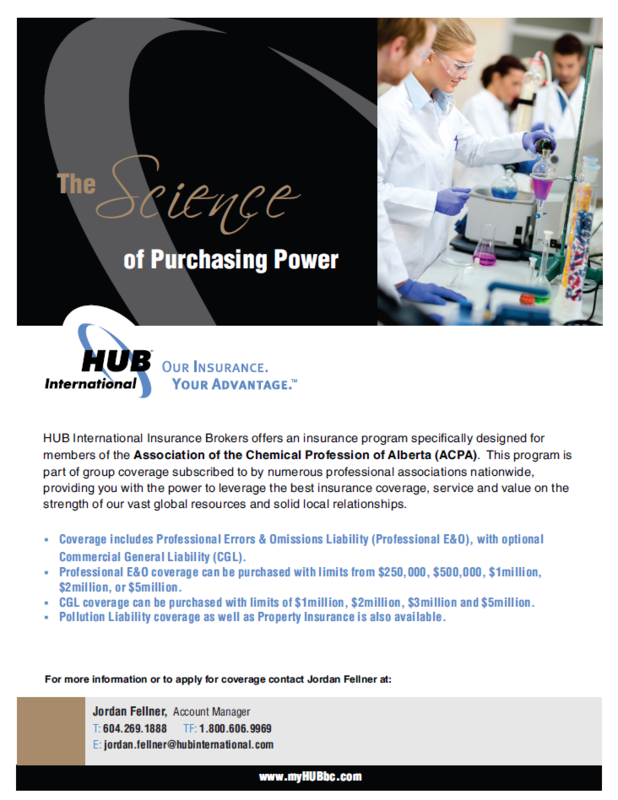 We are happy to introduce our new Liability Insurance package for Professional Chemists. Please sign in to your account under the Member Only Benefits for more information. What is the difference between a “claims made” and an “occurrence” policy? Commercial General Liability: Why it’s not enough for a professional. How can legal expense insurance help protect me and my practice? How important is it for my subcontractors / subconsultants to have insurance? Park'N Fly Airport Parking is pleased to extend its corporate discount program to ACPA members. Members can use the discount code for both business and leisure travel. If you travel frequently, you can save even more by joining the Rewards Program and by claiming Aeroplan miles. Sign in to your account and visit the Members Only Benefits page for your discount code and further information.